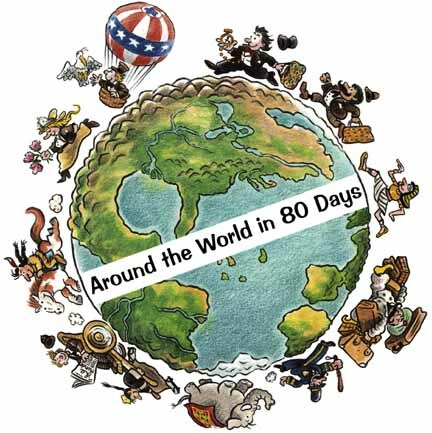 Following the vain of 19th Century adventure and debauchery of previous review Flashman, this week I am going to discuss Around the World in 80 Days, a book in which a rich, and obsessively compulsive eccentric takes on the ultimate challenge of punctuality. The journey is based around a wager made at a gentleman’s club in London in which Phileas Fogg, a fantastic timekeeper, asserts that there is no way that a punctual man could fail to make it around the globe in eighty days. Passepartout is the unwitting servant who finds himself engulfed in Fogg’s escapades, making them more challenging by walking through Indian temples with his shoes on and giving away secrets to the ravenous detective, Fix, who has linked the entrepreneur to a large bank robbery on the day before the bet. The book was written in 1873 and reads very well, not feeling like the stereotypically cumbersome 19th Century novel, probably because it was translated from French at a later date. The book is a slim, between-read, read and can be picked up for £2.50 in the green penguin range. Verne exploits cliffhangers throughout his adventure novels and this is no exception, you cannot stop once you have started and the geography and trivia that is fused with the fictional elements of the book are an interesting match. I would recommend this book as a gateway into the, often feared, area of Victorian fiction, it is accessible sensationalism which is, almost, timeless.